Why Did I Listen To The Invention Of Wings by Sue Monk Kidd? So, Sue Monk Kidd’s The Secret Life Of Bees came out a REALLY long time ago and I remember reading it right around when it came out. I liked it, but remember basically nothing about it. However, I have read nothing by Kidd since then. The Invention Of Wings, though, really appealed to me. I like books with dual narratives. I like books that strongly feature women. Also, I enjoy historical fiction and relish the opportunity to listen to it via audio when good narrators are involved. It seemed like listening to this book was a no brainer. 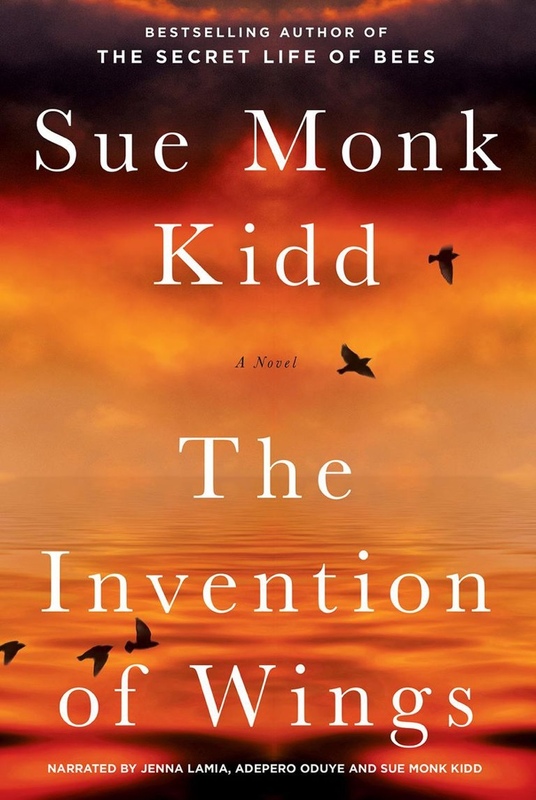 The Invention Of Wings by Sue Monk Kidd follows the story of Sarah Grimke and Hettie “Handful” Grimke with alternating point of view chapters. The book opens up in Antebellum era Charleston. We learn about how Sarah receives a slave at the age of 12. She tries to refuse and fails. Sarah eventually grows to rebel against her Southern upbringing, chafing against the confines of her life. She heads up North, becomes a Quaker and a staunch abolitionist. Meanwhile, Handful, the slave that Sarah is given, toils doing the sewing for the Grimke family as she learns from her mother Charlotte. Charlotte has a plan to buy her freedom along with Handful’s, only it eventually goes awry. Charlotte and Handful end up separated. At which time, Handful gets to know Denmark Vesey, a free Black man, who dated Charlotte. Denmark is busy trying to organize a Slave revolt. Handful gets involved with this. She partakes in some extraordinary acts of rebellion. So, much of The Invention Of Wings, for me was hoping against hope that Handful would find a life of freedom eventually. How Did I Like The Invention Of Wings? The Invention Of Wings was published in 2015. It is perhaps is a product of its time. Like, in 2018, I think that a white person should not write from the perspective of a Black slave. I thought that Kidd was really sensitive in her portrayal. She often calls out the privilege of Sarah and makes Sarah realize Handful’s humanity. Handful has this major role and she is the more interesting of the two. Granted, Sarah is an actual person from history and this is a fictionalized account of her life. I sort of wrestle with where to sit in opinion to this book. The book is very well written. It is compelling. I liked that we got a real life story of someone questioning their upbringing and then taking on risk by voicing their opinions. I also liked that the Slaves weren’t portrayed as passive or happy with their lots in life. The audiobook has two narrators – Jenna Lamia and Adepero Oduye. Jenna Lamia narrates Sarah’s chapters. Adepero Oduye narrates Handful’s chapters. You legitimately could not ask for two better narrators for the book. I am pleased with the quality of this audiobook. I feel like if you want to read The Invention Of Wings you should absolutely experience it via audiobook. You make a good point about it being a product of its time. I remember it was released right around the same time as The Help. In fact, Jenna Lamia narrated both audiobooks. We never gave such things like the color of the author’s skin more than a passing notice back then, did we?